The Uniting and Anglican Churches of Australia have adopted a historic ecumenical agreement which outlines opportunities for shared hospitality, mission and witness in local churches and communities. The document Weaving a New Cloth is the first agreement between the churches to be signed since 1986. Co-Chair of the Joint Working Group Rev. Prof. Christiaan Mostert commended the ecumenical framework to the Assembly saying it would enable and encourage local Uniting and Anglican churches to work cooperatively and to “weave a new cloth together”. The document outlines the areas where Anglican dioceses and Uniting Church presbyteries and congregations can work together in ecumenical cooperation, with their churches’ agreement. Rev. Prof. Christiaan Mostert said the dialogue between the Churches had been ongoing for more than 20 years and had sought to identify areas where there is agreement and where further conversation is needed. 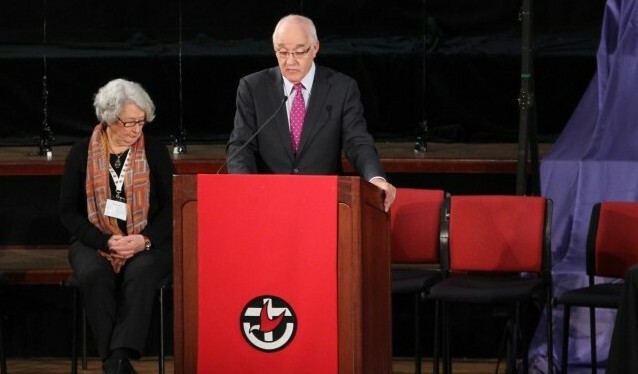 In 2006 the 11th Uniting Church Assembly endorsed a document from the Dialogue called “For the Sake of the Gospel”, but at that time the Anglican Church’s General Synod did not approve it. Three years ago, a new Joint Working Group with the two churches was established to consider ways that ecumenical cooperation would be possible at a local level. Maureen Postma, a member of the Joint Working Group, said the areas of cooperation include hospitality, shared witness, shared ministry in mission including the sharing of resources, joint congregations where there is agreement with local councils to do so, and planned common witness which may include new buildings for shared usage and growth. “This document will open up conversations with the Anglican church in your local area. You have in your hands another avenue of opening conversations and new expressions of unity as brothers and sisters in Christ,” she said.